I’m a technology manager at a small university. 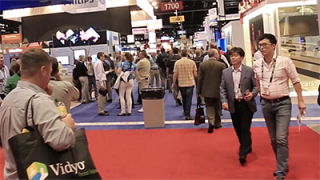 At InfoComm I have to budget my time between what’s a realistic AV solution (for my role) and what isn’t. Every year, new technology is released that I’m incredibly interested in, but would never be a practical fit for what I do. Likewise, I go to the show to see solutions that aren’t necessarily new or exciting, but will be a reasonable fit for my applications. Full BYOD support: The days of outfitting all small conference rooms with a PC and switching and control are over. I’m excited to see more and more “huddle room” type BYOD solutions for presentation, collaboration, and videoconferencing. Vaddio, I know, will have a few products that I’m excited to see. Microsoft Lync compatibility: All of our campuses operate on Lync. Therefore, I’m looking for professional grade equipment that integrates with Lync to provide real-time collaboration and videoconferencing amongst our different locations. I’m looking forward to taking a closer look at Crestron RL, and Polycom’s product offerings, as well as Vaddio’s AV bridge and EasyUSB product lines. Big data: How will products like Crestron’s Fusion, AMX’s RMS (and Extron’s Global Viewer Enterprise, though they won’t be at the show) evolve to provide better data? This evolution is especially important to technology managers and end users. Micro line arrays: Last year Bose and K Array both had micro speakers that could be built into line arrays, with fantastic audio quality for digital signage applications or wherever premium sound with a near invisible footprint is required. Lampless projectors: At InfoComm 2013 I saw a few lampless projectors that were woefully underpowered to provide crisp, clear images with high contrast. I’m excited to see the new lampless projector models, including high-lumen output models. If I, or my staff, didn’t have to change lamps anymore that would be pretty great.